EUR/USD. 65% of people thought the dollar would strengthen and the pair would fall. Starting from Monday, the pair obediently went to the target indicated by experts, namely 1.2300. However, a little before reaching the set level of 1.2335, the bears lost all their advantage, and, after two unsuccessful attempts to break through this support, the pair turned north. The autumn 2014 level of 1.2535 was identified as the nearest resistance on its way up: the pair climbed to it on the first day of February. The forecast of USD/JPY can also be considered fulfilled if not by 100, then, at least, by 90 percent. Most experts, supported by graphical analysis, expected the pair to go up to 109.35, and then further up, to around 111.00, which is where the Pivot Point of the 108.00-114.75 medium-term channel is. USD/CHF. Here, the opinions of experts were divided 50/50. The pair spent the whole week being similarly ambivalent: at first it grew a little, then fell slightly, then went up again, and then fell a little. As a result, the decline over five trading days was as small as 25 points (0.9335). EUR/USD. The absolute majority of trend indicators and oscillators are still coloured green. Only two oscillators signal that the pair is overbought, one of them being on H4 and the other on D1. As for analysts, there is not even a hint of unity among them: 35% think the pair will grow, 35% think it will fall, and 30% are simply disorientated. A clearer picture is drawn by graphical analysis. On H4, it assumes a continuation of the uptrend, with the support being near 1.2400 and the nearest targets being 1.2525 and 1.2570. 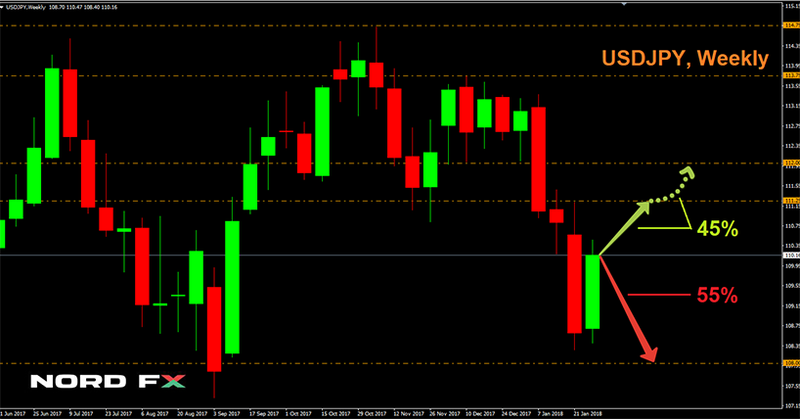 On D1, graphical analysis also largely focuses on support / resistance levels of autumn 2014. The trend is also an upwards one, with support at 1.2340, and a 1.2630 target. GBP/USD. Experts opinion is divided thus: 55% predict growth, 45% foresee a fall. The indicators are mostly directed to the north. Only 15% of trend indicators and 30% of H4 oscillators are painted red. When moving on to D1, however, almost all of them change colour to green as well. Graphical analysis indicates a possible fall of the pair to 1.3950, after which it should grow to the resistance at 1.4275 and then to the peaks of 1.4345 and 1.4515. It should be noted that on Thursday 8 February the Bank of England is expected to release quite a few announcements, although no major changes to UK monetary policy are anticipated. The last pair of our review is USD/CHF. Almost 70% of experts, in full agreement with graphical analysis on H4 and a quarter of indicators, expect the pair to go up first to 0.9575, and then 75 points higher to 0.9650. The remaining 30% of analysts are confident that the downtrend will continue and that the pair will fall into the 0.9100-0.9200 zone. Dear traders, NordFX offers you the opportunity to trade cryptocurrencies with unrivalled leverage of 1: 1000. Deposits in USD and bitcoin.